A research participant at the NIHR Leicester Biomedical Research Centre has scaled the heights of Ben Nevis to raise money for Asthma UK. 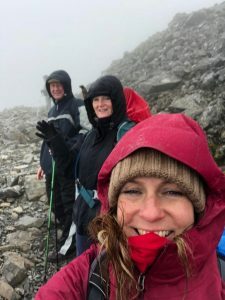 In what might have an unthinkable challenge just 12 months ago, Rachel decided to climb Ben Nevis to raise money to support research into asthma. And so – on 24 August 2018 – she realised this ambition with 14 other brave souls, conquering the Scottish landmark in a time of 11 hours. All the climbers who took part have had their lives touched by asthma in one form or another. Like many other asthmatics, this was particularly difficult for Rachel because damp air and cold conditions are two of her main triggers of asthma. Rachel said: “It by far has been the hardest challenge I’ve ever done bearing in mind less than a year ago I was in and out of hospital with uncontrolled severe asthma and continually on courses of steroids or antibiotics. Simple things, such as climbing a flight of stairs at home, were mammoth tasks for me. I’ve had a lifeline fitted at home, as the last asthma attack I had I was drifting in and out of unconsciousness. Rachel is one of over 11,000 patients who have helped support research across many disease areas at Leicester’s Hospitals in the last year. In her most recent clinical trials, she has provided breath samples for an on-going project using cutting edge technology to investigate whether ‘breath’ tests could be used to tell us more about inflammation in the lungs of patients with severe asthma and asthma attacks. She has also provided blood samples to scientists studying inflammatory cells in the blood. This is on top of taking part in studies to evaluate Mepolizumab, the medication Rachel says helped her to combat her severe asthma. Professor Salman Siddiqui is the severe asthma centre lead at Leicester’s Hospitals and a professor of airway disease at the University of Leicester. He said: “On behalf of the research teams, I’d like to express my gratitude to patients such as Rachel for helping us with our research. New therapies that target specific aspects of lung inflammation have recently become available for clinical use and represent a step change in our capability to help patients achieve better control of their asthma. Rachel and her fellow climbers have raised over £7000.00 for Asthma UK and donations are still coming in. If you would like to support research that has the potential to cure asthma and free the millions of people in the UK from the burden of this disease, the weblink is still active: https://www.justgiving.com/fundraising/rachel-mccarthy5 .